Bread pakoda, love it or hate it, but you definitely can’t ignore it, as this quick snack is all over mumbai! Aloo bhajji is sandwiched between two slices of bread and deep-fried in a flavored besan batter. Place a slice of bread on a clean flat surface and spread ½ of the Potato masala evenly over it. Repeat with the remaining ingredients to make 2 equal pieces. Dip each piece in the batter till it is evenly coated from all the sides, slide in hot oil and deep-fry on a medium flame till they turn light brown in colour and crisp from all sides. Drain on absorbent paper. Cut a bread pakoda into equal pieces, place on a plate and serve immediately with meetha chutney, teekha chutney, sukha lehsun ka chutney and fried green chillies. Hot and tasty Bread pakodas are not ready to be served !!! Healthy, sweet and Fruits. Its and all in one dessert which contains loads of fruits and is lovable by all. Cook this easy to make recipe at home and serve chilled. (Banana, apple, pineapple, papaya, musk melon, chikoo /sapodilla, pomegranate, pear, Kiwi, grapes(seedless), strawberry etc).Do not add watermelon as it oozes water. Gujia (Hindi: गुजिया) (also called Gujhia), a cuisine of North India particularly Uttar Pradesh, Madhya Pradesh and Rajasthan is a sweet dumpling made with suji or Maida flour wheat flour and stuffed with khoya. The packaging of a gujhia is very much like that of a samosa, however the gujhia has a very distinct shape. The gujhia is filled with a mixture of grated and roasted dry fruits, khoya, coconuts and to add a grainy texture, a little suji (coarse ground wheat flour). Keep adding water as required and knead into a soft but tight dough. Fill half the round with the khoya mixture, fold it and seal the round, twisting the edges inwards. Heat ghee in a kadhai and deep fry the gujiyas in batches on a medium flame.. Tip : Gujiya moulds can also be used (they are easily available in any store or market). For using moulds, place the rolled dough ball in a greased gujiya mould and fill a tbsp of filling mixture on one side. Get ready to serve Gujiya and Happy Holi !!! Khus Cooler is an easy to make cool drink recipe which can be made easily and served on any occasion. Khus is also known as Chrysopogon zizanioides, commonly known as vetiver (/ˈvɛtɨvər/; from Tamil வெட்டிவேர்), is a perennial grass of the Poaceae family, native to India. In western and northern India, it is popularly known as khus. Mix all the Ingredients, top with crushed ice and serve immediately. That was simple right. So get set going. The 'Carrie' mango is a named mango cultivar that originated in south Florida, USA. The fruit is small, averaging a pound or less, and ripens from June to July in Florida. At maturity it may be green to yellow, but the fruit doesn't develop red blush like other mangoes. It is also widely used in India to make a Cool Drink. To get the Raw mango Puree, pressure cook the raw mango, remove skin, take out the pulp, blend to get a thick puree. Strain. Add the sugar, water, jeera powder, black salt and salt to taste. Mix well. 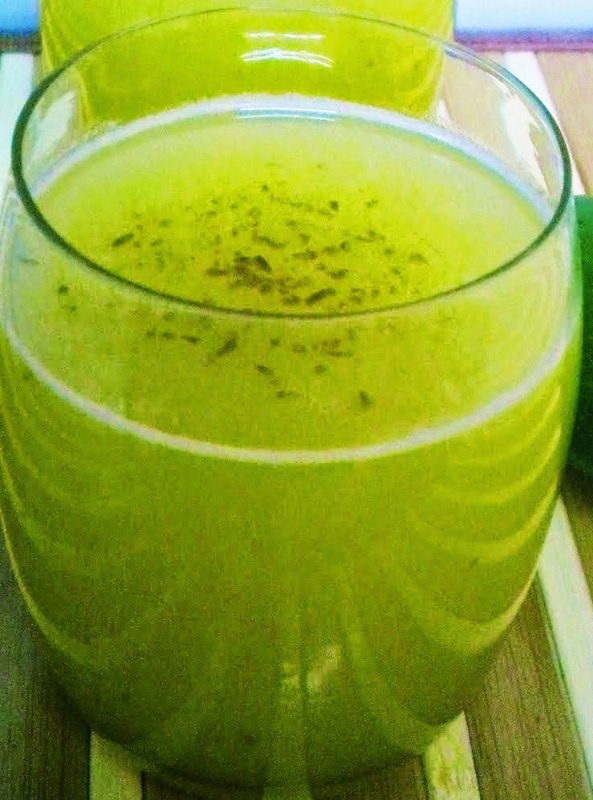 Serve Aam ka Panna Chilled garnished with small boondis soaked in water. 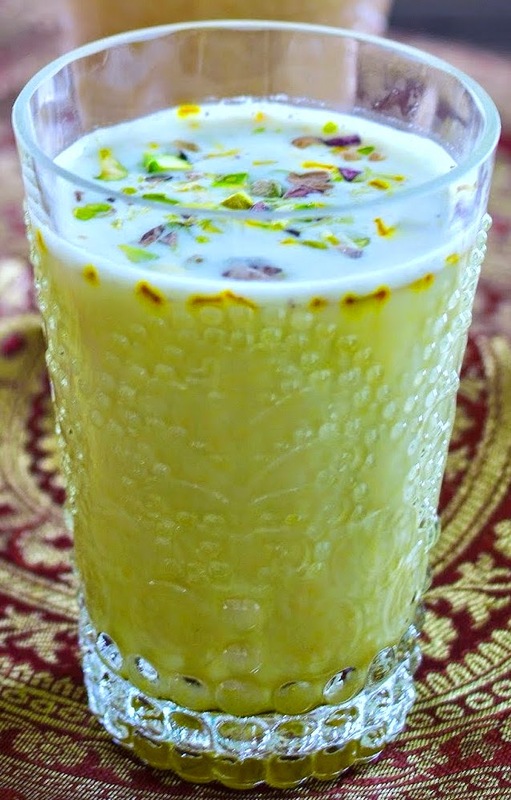 Thandai, most commonly known as "Sardai", is a cold drink prepared with a mixture of almonds, fennel seeds, magaztari seeds (watermelon kernel), rose petals, pepper, vetiver seeds, cardamom, saffron, milk and sugar. 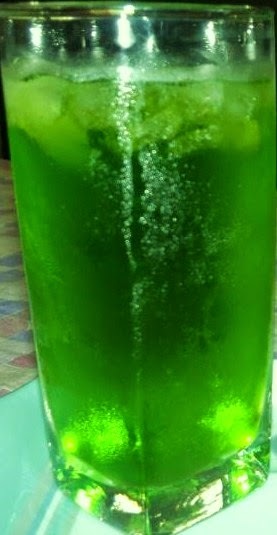 This drink common in Khyber Pakhtunkhwa, Pakistan - mostly in Peshawar. It is native to India and is often associated with the Maha Shivaratri and Holi festival. Holi and Thandai are synonymous with each other. Try these traditional drinks and have a fun filled colourful Holi. Soak the Almonds for 5-6 hours. Soak the watermelon seeds, poppy seeds, pepper corn, cardamom and Rose petals for 3-4 hours. Peel the almonds and add it to the above Ingredients. Grind in the Mixer to get smooth paste. You may add a little Milk. The paste should be of a smooth consistency. Add the Sugar and the Above grounded Ingredients and mix well. Strain the Mixture through fine sleve. Dissolve the saffronin a little milk and add it to the above Thandai. 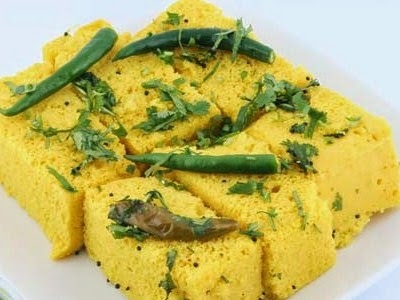 Dhokla or Dhokra is a vegetarian food item that originates from the Indian state of Gujarat. It is made with a fermented batter of gram flour (chickpeas). Dhokla can be eaten for breakfast, as a main course, as a side dish or as a snack. It can usually be bought from a sweet shop. Serve with Green chutney to make Instant Dhokla Recipe tasty. Cheesy stuffed Potato recipe is an easy to make interesting Potato recipe which is not only healthy but really yummy too. Without Peeling the skin of the potato cut the potato into two equal halves. Now dig the potato from the middle of it using small spoon until it appears like a potato bowl. Inside this potato put Milk, Shredded Cheese, Salt and pepper. Bake the potato till it becomes Golden Brown. You are now ready to serve this delicious vegetarian dish. It’s a very complex situation when it comes to decide about the evening snacks. So we always tend to visit the fast food counters to quench our hunger for snacks as we lack time at home. Thinking of this situation I had always wanted to make something which can be easily prepared at home. Home cooked food is always healthy and this is the only reason I decided to make these Crispy Stuffed Vegetarian Cones. The entire idea was to bring a new member to the family of snacks and keep aside the junk food that we all munch on whenever we think of evening snacks. Lets split the whole process into 2 simple parts, preparing the stuffing and the cone. You should cook all the vegetables separately at first. Heat oil in a wok till its smoking hot. Add the chopped potatoes. Add pinch of salt and stir it well. Take it out when the potatoes are crisp. Keep aside. Now add the chopped carrots and the cup of green peas to the oil. Add pinch of salt and stir well until it becomes soft. Take it out and keep aside. Now its time to cook the finely chopped red and green peppers and the tomato together. Make sure you don’t cook it for long as you will lose the green and red color if overcooked. Take out the mixture and keep aside in a bowl. Now mix the crisp potatoes, chopped green chilies, cooked carrots and peas, red and green peppers and tomatoes together in the wok in 1 teaspoon oil. Stir it for 2 minutes in low flame. Take the paneer cubes and crush with your hand and mix it with the vegetables in the bowl. Take the flour in a big bowl, and mix salt as per taste with 2 tablespoon of oil. Pour in half cup water and mix the dough well to almost dry. Then again pour half cup of water and mold well. When you see the dough is not sticking to your palm, then it’s ready. Divide the dough into medium sized balls, take little oil for lubrication and roll each of them to around 6-7 inches. After this is done wrap the rolled out maida to the cone and wrap the cone properly. Make sure you stick the edges with water else it won’t come out neatly from the hot oil. In the meantime heat the oil in medium flame. Then drop the maida wrapped cone along with the paper cone in the oil and fry in low to medium flame. Take it out when it turns light golden brown. Make 5-6 cones following the same procedure. Your well crafted cones are ready. Now fill the cones with the cooked vegetable and serve with the green chutney or sauce . Your crispy vegetarian stuffed cones are ready and am sure this recipe will be a favorite item among your family members and specially among the kids. Chilli Paneer is an Indo-Chinese starter or snack which is really very easy to prepare at home.Actually soups and starters are which i usually skip and start with the dishes right away when going to eat out. So the first time I tasted Chilli Paneer, which was very recently in the restaurant, it was more like Gobi 65 and they called it Chilli Paneer. So i decided to come up with a genuine recipe for Chilli Paneer. 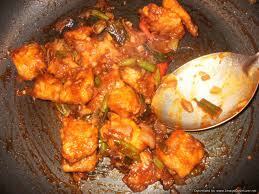 Make a thick batter of the ingredients under 'to marinade' and add paneer to it and coat it well. Then toast the coated paneer in dosa tawa until golden brown. (You can deep fry them too).Drain it in a tissue and set aside. Get all the ingredients ready.Heat oil in a pan, add chopped green chillies,onion and garlic. Then saute till slightly browned. Then add capsicum and fry for a minute. Then add soya sauce, tomato sauce , chilli sauce and pepper powder.Mix well until the veggies are coated evenly.Make it to a semi saucy consistency. Then add the toasted paneer and give a quick stir. Finally garnish with chopped coriander leaves and switch off.Serve as a accompaniment with fried rice or just as a starter and am sure you will make this often.The fusion of indo chinese sauces with the flavour of coriander leaves tastes juts out of the world. I served it with egg fried rice and hubby totally loved the combination. Voila , you are ready to serve Paneer Chilli Dry now with little garnishing and chutney or ketchup !!! India’s popular snack that finds a place in almost every bakery or chaat shop – our very own Samosa. Savory comfort food at its best, a crisp exterior filled with a savory potato stuffing that goes very well over a hot cup of chai especially on a rain filled, cold day. 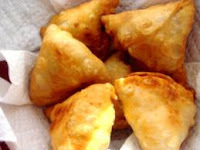 Samosa is always store bought and on rare occasions prepared at home, like today. Sprinkle water and make a hard samosa dough. Set aside for about 10 minutes. Heat the ghee and add cumin, when crackling add ginger and saute. Roll each portion of dough into a thin oval shape cut into 2 semi-circles. Take a semi-circle. Apply water on the straight edge of the semi-circle. Hold the semi-circle in your hand, fold the straight edge, bringing together the watered edges, seal the watered edges into a triangular pocket. Stuff the potato mixture and then seal the upper edges. Repeat with the rest and your delicious samosas are ready. Chop the green chillies, ginger and the coriander leaves along with Chutney or Ketchup and Serve. Potato Roll Recipe -How to cook Aachari Aloo Rolls? Achaar or Pickle is synonymous with indian cuisine. Undoubtedly, it adds a brilliant touch to wraps too! lacing the spicy potato filling with aam aur chane ka achaar makes your tongue tingle with joy. I’m sure you’ll love it purely because of its simplicity. This recipe has to be planned in advance as the achaar has to be marinated for 3 to 4 days. Else, you can buy readymade aam ka achaar. It can also be served as Snacks with afternoon tea. We suggest you buy a ready made Aachaar from the market to instantly prepare the Aloo Rolls. How to cook spicy potato filling for Rolls? How to make Spicy Potato Rolls - Aachari Aloo Rolls ? Aachari Aloo Rolls tastes good with roti. Check How to make Roti here. Spring rolls, a classic Chinese dish which has become immensely popular in India. They are traditionally served on the first day of the Chinese new year. This recipe tells you how to prepare the covering as well, so you don’t need spring roll sheets available in the market. You can experiment with the stuffing, though we have used an assortment of vegetables and sprouts. These rolls, deep-fried are cut up and served fresh garnished with grated vegetables. Its crunchy, delicious taste is what makes it a huge hit at parties. It tastes great served with schezwan sauce. How to make Spring Rolls Pancakes ? 1. Combine the plain flour, cornflour, milk, salt and ½ cup of water in a bowl and mix well till no lumps no remain. 2. Grease a non-stick pan with butter, pour 2 tbsp of the batter into the pan and tilt it around quickly to make a 100 mm. (4”) diameter thin circle. 3. When the sides begin to peel off, turn the pancake and cook on the other side for 30 seconds. 4. Repeat with the remaining batter to make 11 more pancakes. How to make Vegetable Spring Rolls Stuffing ? 1. Heat the oil in a wok /kadhai on a high flame till it smokes. 2. Add the spring onion whites, mixed vegetables, bean sprouts and msg and sauté on a high flame for 3 to 4 minutes. 3. Add the noodles, spring onion greens, soya sauce and salt and sauté on a high flame for another 2 minutes. 4. Divide the stuffing into 12 equal portions and keep aside. How to make Wrapped Vegetable Spring Rolls? 2. Apply a little flour paste along the edges of the pancake. 3. Fold the top edge over the mixture to seal it firmly. 4. Fold the left and the right side of the pancake in order to get a rectangle. 5. Roll the pancake downwards tightly sealing the ends securely with the flour paste. 6. Repeat with the remaining ingredients to make 11 more rolls. 7. Heat the oil in a wok / kadhai and deep-fry in batches till they turn light brown in colour. 8. Cut each roll into 2 equal portions and serve hot with schezwan sauce. Get ready to serve Hot Spring Rolls Homemade!!! 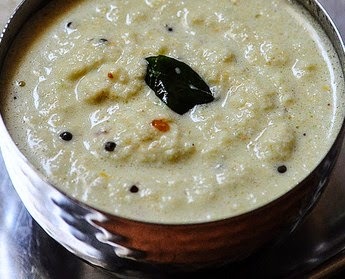 Easy coconut dip is one of a tasteful side dish of madras. Its serve with snacks to tantalize taste buds and enjoy. You can prepare it with tea time snacks. 1. In a pan, heat oil and saute fennel seeds, whole red chilies and curry leaves. 2. Then roast chopped coconut in dry pan. salt to taste in a blender jug to blend. 4. Serve in a serving bowl. Eat it as a side dish with Roti and other curries. Also tastes good with snacks. This green dip makes a nice change from your usual dip. A tangy blend of green coriander, mint, tomato and tamarind pulp. It's perfect served straightaway with your main dish. 1. In a blender add all ingredients and blend them without using water, make a paste and serve. 2. You can adjust sour taste of imli according to your taste. Get ready to serve it with delicious snacks or as a side dish with roti and curry. 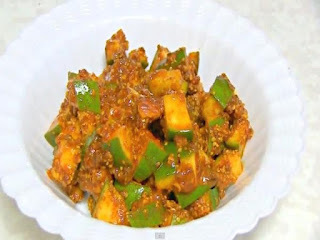 Green Tomato Chutney or Tamatar ki Chutney is a dip that can be served with fried thing like rice cheese balls or roast. This dip is titled as Green Tomato Chutney because green tomatoes are used in addition with green chilies and green coriander. Try it out to enhance the savor of your side dishes. 1. Roast tomatoes on stove. 2. Now in a blender, combine roasted tomatoes, green chilies, green coriander, garlic, white cumin and salt, blend well. 3. In a frying pan add grounded chutney, lemon juice and crushed red chilies. 4. Fry for 5 minutes and serve. Voila !!! You are ready to serve it with the delicious snacks or roti and curry as side dish. 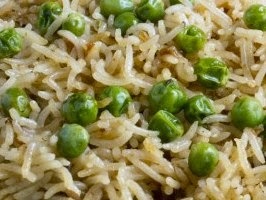 Matar Pulav is a easy to cook Rice Dish which can be prepared quickly and tastes good and is very healthy. In a heavy-based pan, heat the ghee and add the cumin seeds and ginger. When the ginger browns a little, add the rice, peas, garam masala, salt and turmeric. Stir-fry well. Leave uncovered. Add 4 cups water and bring to a boil. Lower heat and cover. The rice should be done in about ten minutes. Serve hot. This Hot Rice Dish is now ready to serve with Raita, Curd or curry. Daal Dhokli is simply a bowl of warmth and goodness. From the state of Gujarat, Dal Dhokari is made by cooking spiced chapati dough with spiced toor daal. The end product is a delicious one pot meal. If you have some Gujarati Daal leftover, Daal Dhokli is a quick meal. However, for those of you who don’t have any Gujarati Daal on hand, don’t worry. This Dal Dhokri recipe is for you – from scratch! That's a long list of Ingredients, but it makes it taste good. How to make tasty Dal Dhokli ? 1. In a pressure cooker, add drained Toor Daal, Peanuts, Fenugreek Seeds and 2 cups Water. Pressure cook for 2-3 whistles for soaked daal or 5-6 whistles for unsoaked daal. Allow pressure to go down by itself before opening pressure cooker. 2. In a bowl, add Chapati Flour, Chickpea Flour, Ajwain, Turmeric Powder, Salt and Red Chili Powder – mix well. 3. Add 1 Tbsp Oil and mix again to incorporate the oil into the flour. 4. Add Warm Water little at a time to form a stiff dough. Knead for 1-2 minutes. 5. Drizzle a few drop of oil and coat the dough ball. Cover and let dough rest for 15-20 minutes. 6. In a large pot, heat Oil and Ghee. Once hot, add Cinnamon Stick, Cloves, Mustard Seeds (allow them to pop), Ajwain, Dry Red Chili, Asafoetida, Turmeric Powder, Curry Leaves, Ginger and Green Chilies. Mix. 7. Immediately add Green Peas and cook for 1 minute before adding Tomatoes. Mix. 8. Add cooked Daal, 5 cups Water, Salt, Jaggery, Tamarind Pulp, Red Chili Powder, Garam Masala, Cumin Powder and Coriander Powder. 9. Allow mixture to come to a boil. 10. Meanwhile, knead dough once again and divide into 2-3 portions. Lightly grease rolling surface and roll out dough balls into thin discs (thinner than chapati). With a sharp knife or pizza cutter, cut dough into small diamond shapes (roughly 1 inch pieces). 11. Once Daal comes to a boil, reduce heat to medium and add in dough diamonds while stirring. Roll out remaining dough and add diamonds quickly. 12. Cover and cook for approximately 30 minutes, stirring in between. Dhokli should not have a raw taste. 13. Once cooked, switch off stove and add Lime or Lemon juice to taste. 14. At the time of serving, garnish with Cilantro Leaves and drizzle Oil or Ghee over the top. In the Indian state of Rajasthan, Panchratan Daal is traditionally served with Baati, bread balls made with whole wheat flour. This versatile daal recipe which is made by combining five types of lentils can also be enjoyed with chapati or rice. The wonderful flavors and textures of the various daals will make this panchratan daal recipe a family favorite. Simple Recipes Cooking Method : How to make Tasty Panchratan daal? Combine all Daals and wash thoroughly. Soak for 30 minutes. Drain soaking water and add soaked Daals to a pressure cooker. Add 1 tsp Salt, 4 cups Water and pressure cook for 1 whistle. Switch off stove and do not open cooker until internal pressure is gone. Meanwhile, heat 1 Tbsp Oil and 1/2 Tbsp Ghee in a pan on medium heat. Add Bay leaf, Dry Red Chili, and Cumin Seeds. Allow Cumin Seeds to sizzle. Add Cloves, Black Peppercorns, Asafoetida and Turmeric Powder. Mix. Immediately add Onions and a little Salt. Mix well and cook for 1-2 mins. Add Garlic, Ginger and Green Chilies and cook for 2-3 minutes. Add pureed Tomatoes and cook until oil separates from the mixture. Add Coriander Powder, Garam Masala, Cumin Powder and Red Chili Powder. Mix and cook for 1 minute. Add cooked Daals and mix well. Add 3-4 cups of Water allow Daal to come to a boil. Garnish with Lime/Lemon Juice and Cilantro. Add Red Chili Powder, mix and add to top of prepared Daal. Serve hot with Bati, Rice or Chapati. Sweet Potatoes (also known as yams) are a nutritious alternative to regular or common potatoes. They are high in fiber and rich in vitamin C, beta carotene, B-complex and iron. Try substituting these baked sweet potato fries with your sandwich or soup instead of potato chips or regular French fries. It can also be taken as a yummy afternoon snacks which is healthy too. Wash, peel and cut Sweet Potatoes to desired size and shape. Avoid cutting very thin slices. Drizzle just enough Olive Oil to coated the potatoes well. Sprinkle a little Salt (careful: you will be using more later) and toss well. Line a baking sheet with foil and arrange potatoes in a single layer. Place baking sheet on the middle rack of the oven and bake for 15 minutes. Toss the fries. Move baking sheet to the top rack of the oven and broil on high for 5 minutes (or until fries golden brown). Remove from oven and transfer into a bowl. While the fries are still hot, add Citric Acid, Red Chili Powder, Garam Masala and Chaat Masala. Toss to coat spices evenly. Its now ready to serve with Chutney or Tomtao Ketchup. Simple Recipes Cooking Method : How to make tasty Palak Khichdi ? Wash and soak the dal and rice together for 30 mins. Grind all the ingredients under the 'to grind' list adding no water. Heat the oil in a pressure cooker pan and add the jeera. When it splutters, add the chopped onion. Fry until golden brown. Then add the chopped spinach and stir until soft and wilted. To this, add the ground paste and mix well with salt, turmeric, red chilli powder and garam masala. Let it cook for a min. Now add the soaked rice and dal. Add 4 cups water. Cook for 4-5 whistles in the pressure cooker. If you are using a normal pan, make sure you cook covered until the rice and dal is cooked thoroughly. While hot, mix in 1 tsp ghee and serve. Can also give some curd or raita along withe some chutney. Maharashtrians would feel lost without poha! Beaten rice flakes tossed with the traditional tempering of mustard seeds, chillies and curry leaves, this is served aesthetically with tiny wedges of lemon. If you are in a rush, you can just grab a readily available parcel of poha and have it later in the comfort of your office. Extremely simple to make with subtle flavors from the spices. Its soft, chewy and filling. There are many preparations and recipes for Poha, or flattened rice. In this recipe poha is washed gently and fluffed up to make a soft and savory dish known as Kanda Poha. It is a quick breakfast idea or perfect tea time snack. Simple Recipes Cooking Method : How to make tasty Kanda Poha ? Wash poha and drain water completely and leave aside for 5 minutes. Heat oil in a pan add Mustered seeds, hing, green chillies,onion and turmeric powder cook for 5-minutes. Now add the ginger garlic paste and cubed potatoes and fry until the potatoes are cooked well for 2 minutes. Add red chilli powder, coriander powder, salt and sugar. Add poha and mix well, last add lemon juice. Voila , you have a ready to eat Breakfast !!! You can spice it up with some Red Chilli Ketchup. You can also get the ready made sause outside. Simple Recipes Cooking Method : How to make tasty Veg Manchurian? Heat oil in a large wok and once the oil is piping hot, add the chopped garlic and stir fry for a few seconds. Add the green chillis and ginger and stir fry on high for a few seconds. Add the whites of spring onions and stir fry on high for 2 mts, constantly tossing them. Add the vegetable balls and stir fry for another 3 mts. They should retain their crunch. Reduce to medium heat and add the brown sugar, soya sauce, tomato ketchup, chilli sauce and vinegar. Mix well and cook for 2 mts. Add 3-4 tbsps of water and cook for 2 mts. Toss on high flame for 1-2 mts. Turn off heat. Garnish with the chopped spring onion greens and/or coriander leaves. Doesn't it Taste it good !! !